ProMix M B Controls | ProMinent Fluid Controls, Inc. 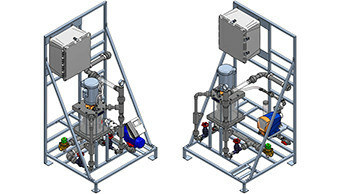 The ProMinent ProMix™ is a pre-engineered polymer mixing system made for the water and wastewater markets. Designed as an in-line unit, the ProMix™ can be customized to meet most liquid polymer applications. The unique mixing chamber allows for complete makedown of the neat or diluted polymer to guarantee a problem-free injection.